Well then keep on reading and follow the links to Toushka's blog! The lovely and kind Toushka from the awesome blog Ramblings from Toushka, was kind enough to put her hand up to make something from, and review, a new title that I have arriving at work in September called Simple Sewn Gifts. I just think this books is so sweet and gorgeous. The one problem is, I can't sew! So I have no idea how easy the instructions actually are to follow! I can tell you how pretty it is and how good the photography is, but I can't pass judgement on how easy the projects are to make. So Toushka gladly agreed to be Guinea Pig and find out just how easy the instructions are! If you're familiar with Tone Finnanger (Sew Pretty Homestyle, Crafting Springtime Gifts, etc) and the powerhouse that is Tilda then you will definitely want to get your hands on a copy of this title. My first thoughts when I picked up this book was how pretty it was. The gifts are cute and the pages are beautifully laid out, clear and uncluttered. It is a really beautiful book, easy to read and navigate. The only thing that would make it better is if it was spiral bound so it could lay flat for easier reading and tracing of the templates. It says there are 25 Fast and Easy gifts. 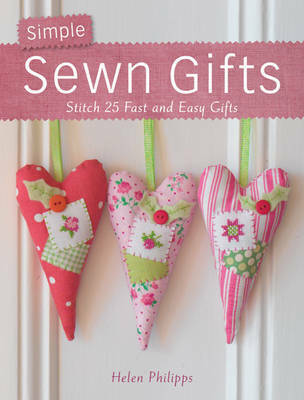 That is true, but each gift is so versatile and throughout the book there are tips to use the appliques and cross stitches in different ways to make other gifts, so it's really many more than just 25 gifts. I'm not a big cross stitcher so I didn't do the cross stitch portion of this project - and that's ok. The little patterns for the cross stitch look almost easy enough that I may one day give it a go. But in this instance I think I got away with using a piece of fabric that had a print on it. 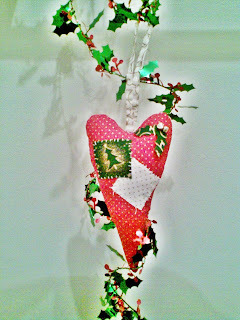 These gifts are easy to make - this one took 2 hours start to finish and I hand stitched it, which was lovely and relaxing. I think it would be a great book for crafters to share with their children as the projects are quite easy for beginners. The gifts are not just Christmas gifts. The book is separated into three categories; At Home, Loved Ones and Get Festive. The gifts include aprons, bags, bunting and even an egg cosy, so there really is something for everyone. I think you'll all agree that this title is well worth the money and Toushka did a great job on that cute little heart! If you'd LOVE to win a copy of Simple Sewn Gifts then head on over to Toushka's blog and enter the giveaway! It's easy to enter, all you have to do is become a follower and leave a comment! There are also other ways to get extra entries, so make sure you pop over there and leave your comment!